The 2nd best medicine around. But nowhere near the top. The messages keep flooding in, one after another. On Twitter. On Facebook. On my phone. In my email. Close friends. Random acquaintances. Total strangers. All expressing their support. Or offering prayers. Or wanting to know what they could do to help. Or all three. To be honest, overwhelming doesn’t come close to describing the response to last week’s blog about my cancer diagnosis. I’m not really sure what I was going for, really, other than the pressing need to get it off my chest. Subtlety has never been my thing, I mean I’m the same guy who proposed to his wife in a column nearly 10 years ago. Amazingly, Ellie said yes that Saturday morning in June 2004, even though she later admitted she didn’t actually read it at the time. Instead she stared at the page and waited the appropriate 90 seconds while I fumbled with the ring and tried not to vomit. How could I? I consider myself a tough guy to know. For all my chattiness, I keep people at arm’s length even while I spend most of my professional life doing a pretty solid Arnold Horshack impression hoping to sate an ego that sometimes gets the best of me. So when the notes started coming in _ and really, they haven’t stopped _ I wasn’t sure what to do (and I’m still not). For someone who loves attention, I’m terrible at handling it when I get it. What’s the proper way to thank people to making time to reach out no matter how long it’s been since we’ve spoken? To honor their compassion for thinking of you during one of the most difficult moments of your life? To repay the gift of those _ from family members to old friends to folks who’ve never laid eyes on me _ who have promised to donate blood or make a charitable donation of some sort, a truly life-saving gift for whoever receives it? I have no clue. I guess I’ll just keep writing. I’ve asked people in the last week what should come next and their answers mostly fell in the “talk about whatever you want” camp. Funny, I’m not sure what that is anymore. Maybe because for once it’s not just about me. Am I “Cancer Guy?” Am I “Blood Donation Guy?” Am I “That dude that got sick and is turning this into a career springboard Guy” (kidding about that last one, well, probably). I can tell you in the last 10 days the catharsis that came with disclosing my diagnosis and the high from the half-gallon of blood I received from random donors has faded. Reality has set in. I’m a cancer patient in practice now, not just in theory. 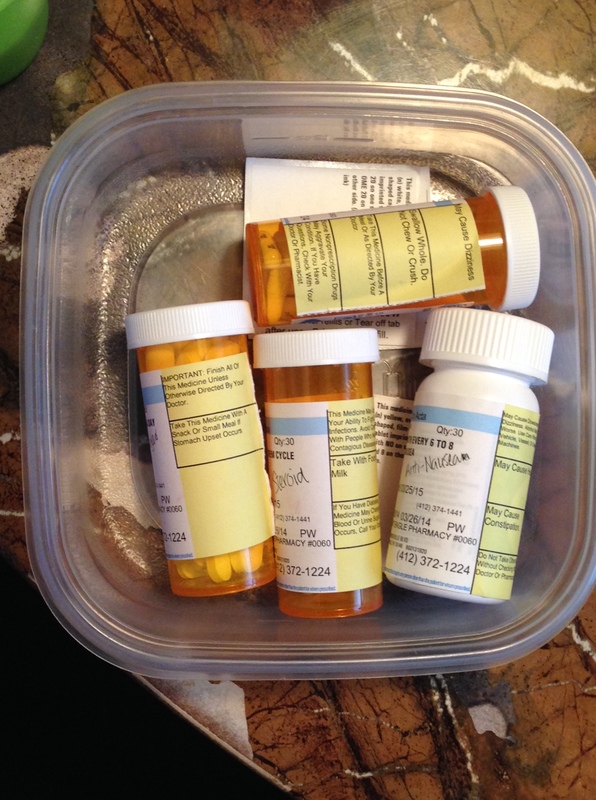 Each morning starts with a handful of pills, drugs for my drugs. Every 3-4 days I receive a small chemo injection into my abdomen that over the next 3 months will turn my gut into the world’s ugliest checkerboard thanks to the bruising that comes when your depleted platelets need scads of reinforcements to deal with the incessant barrage of needles. Next Monday I go in for my first dose of IV immunotherapy, a mixture that includes mice DNA and probably more than a bit of my sanity. And yet, I know I’m lucky. That part hasn’t changed. While prepping for treatment on Monday, I sat down next to another patient who will turn 90 this summer but easily looked 20 years younger. The oldest of eight kids (and the only daughter) she is now the matriarch of a massive family to which she remains the linchpin. She smiled while the nurse tucked the IV into the port on her chest and settled in to read a book while the bag slowly dripped the life-saving poison (because really, that’s what we’re talking when we’re talking about chemo) into her veins. There was no drama. She didn’t look to the heavens wondering what it all means, when this battle will end. She read quietly and went about her day. It wasn’t heroic (except for the part where of course it was). She wasn’t trying to send a message. She was just doing what she had to because, well _ that’s what millions do every day, really _ when they’re faced with this monster. Even while I bound up the steps after my kids, even as I brag I’m too damn arrogant to let this thing get to me, even as I refuse to park in the designated “cancer patient” spots at the treatment center, I’m well aware of what my family and I face. It’s menace is evident every time I get to the top of the steps in my house and wait to see if my pulse will start pounding inside my temples again. It’s there every time I get my blood tested, where my mood on a given day will depend entirely on my hemoglobin level at the moment. It’s there when I toss back a handful of pills and hope the steroids I’m on (and really, to be fair, they’re fantastic) will also make me so edgy I accidentally snap at my kids. It’s there in the research Ellie and I have done on Waldenstrom’s Macroglobulinemia, which constantly reminds us there is no cure, at least not yet. And it’s intimidating and terrifying and at the same time, it’s no big deal. I wrote last week that “Cancer will not have me.” Know what else cancer doesn’t have? Sorry cancer, you asked for it. Right Eric B. & Rakim ?